Unlike a large percentage of professional poker players within the poker industry to date, Jason Mercier doesn’t possess a story that tells of how he played poker from a young age with his parents, instead Mercier only started playing poker professionally back in 2008, after seeing the infamous Chris Moneymaker 2003 World Series of Poker Main Event victory which netted Moneymaker $2.5 million in prize money. Since deciding to participate in one of the world’s fastest growing online gambling games, Mercier has demanded a huge amount of respect from his fellow poker players, letting his results do the talking and seeing this professional poker player raise through the ranks at a rapid pace. Since 2008 when the player started playing the game, Jason Mercier has been able to generate more than $4.3 million in poker winnings, opting to play live poker rather than the online version of the game. With 7 titles, 18 final table finishes and 31 poker tournament cashes, you can’t help but think that this young professional is set for great things. Mercier possesses a great talent for poker and his game play is diverse to say the least, excelling in a number of poker variants within his so far short but very successful poker career. Not one to be afraid of competition and meeting some of the biggest names in the poker industry, Mercier has regularly entered into the World Series of Poker (WSOP) tournament series and has once again seen a high level of success in terms of placement within the tournaments that he has entered, cashing in no less than 7 tournaments and earning himself a total of $344,892 to date, just from the World Series of Poker tournaments. With a thirst for playing some of the biggest live poker tournaments in the annual poker calendar, Mercier has also entered into tournaments within the World Poker Tour (WPT) as well as participating in the European Poker Tour (EPT), which has proven to be the most profitable for the poker pro, cashing a total of $1,096,000 from that tournament series alone. The most recent placing that the player has made was in February 2010, with Jason Mercier taking a tournament prize payout of $141,780 from the L.A. Poker Classic tournament series after entering into Event 50 – High Roller Event – No Limit Texas Hold’em Poker. Although preferring to play the majority of his action within a live poker environment, the pro poker player does represent the biggest online poker room in the world, opting to join the professional roster and improve his repuation and global awareness. Mercier has become a hot tip for a number of poker fans who like to wager on who will win large live poker tournament events and with the player firmly stacking up winnings and victories in a number of his chosen tournaments, its no surprise that people are placing their money on the young pro. 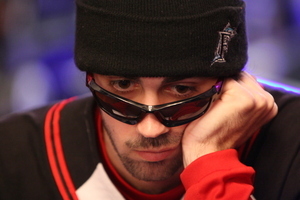 With the public taking an interest in the player, it wasn’t long before their backing lead to the call that Jason Mercier should be considered to become player of the year in 2009 and Bluff Poker Magazine stepped up to the plate to name the pro their Player of the Year for 2009.